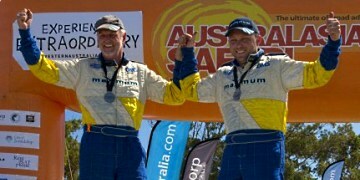 In 2011 Rob Herridge scored a category win on debut at the Australasian Safari. Twelve months later he not only defended his Safari Production title, he and the #105 Subaru Forester S, the smallest auto in the field, completed the week-long enduro in 2nd outright. "The result was well beyond our expectations. Not only did we re-claim the Safari Production title, we came second outright and even won a few stages along the way", said a delighted Rob Herridge at the end of the gruelling event. "The Safari course was particularly tough this year. If you look at what happened, it was only ourselves and the outright winner, John Hederics, who had relatively clear runs. We were not even thinking about an outright podium position before the event. 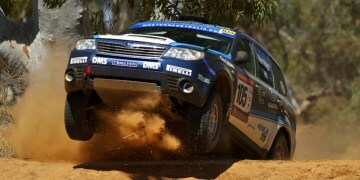 But it's a testament to Subaru cars and just how tough they are, that we could achieve this result. We're rapt." This year the Australasian Safari followed a course north from Perth, Western Australia, to Geraldton and Carnarvon, then inland to Gascoyne Junction and some of the most remote country in Australia. 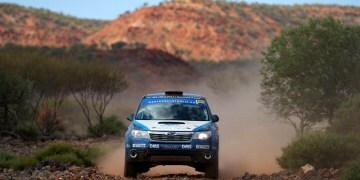 During the seven legs of the event, crews contested 3500kms of competitive stages, with terrain ranging from rock-strewn beaches and sand dunes, saltbush flats, flood-damaged river plains, sandy creeks and river crossings, rough rocky ranges and typical outback station roads. "After having a taste of the Safari last year, we extensively rebuilt the car and we had a very good shakedown before the event. But to find ourselves in 2nd outright after only three days, was completely unexpected. Traditionally the Australasian Safari has been dominated by much larger 4WD vehicles, but I think the Forester has proven it combines ruggedness in a smaller, better handling package." Photos courtesy of Keith Hedgeland and Chris Parker. Last edited by waggaclint; 7th October 2012 at 02:00 AM. Someone care to explain the cables from the bonnet to the roof? Last edited by sjm; 7th October 2012 at 04:30 AM. That is Awesome!!! Go Subie!! !